We are very glad to aanounce Astropreneurs is back again! Astropreneurs supports entrepreneurs, startups and SMEs, coming from space and non-space sectors, to create viable business cases and have faster markets approaches by mentoring them on businesses and technical needs, helping them to access private and public funding, but also to overcome the financial, administrative and networking barriers that are now preventing them from more success in the commercial phases. 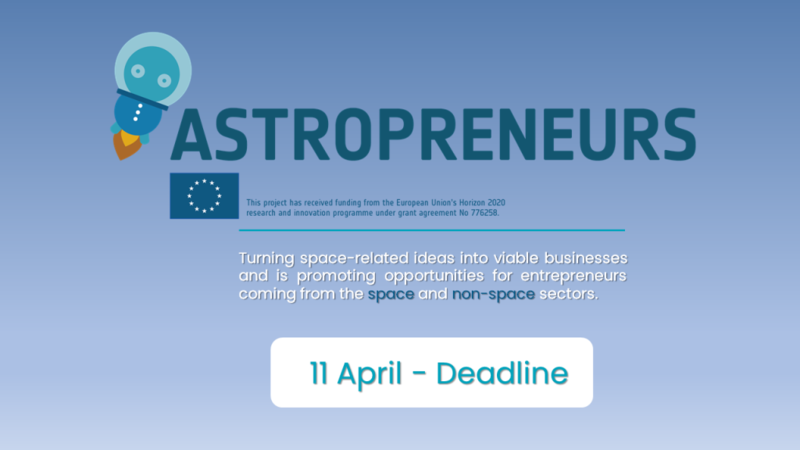 Call for Startups: The purpose of this call is to select entrepreneurs, spin-outs, start-ups, SME or others to receive mentoring, as part of the EU-Horizon2020 funded project “Astropreneurs”. Up to 50 hours of mentoring is available for each successful applicant, over a 3-month period. This will be an open call, running until January 2020 and all mentoring will be completed until June 2020. If you want to apply before the 11th April, you can do it HERE! Stand out from competitors with ESA patents. Recruitment support to our startups!